Throughout the symposium several speakers made statements (or jokes) about the name “gastrophysics”, and in his opening remark Jens Risbo suggested it should be a “science for the benefit of the chefs and good food”. Félix Goñi argued that gastrophysics should “improve the cooking of normal people”, rather than that of the top chefs. Peter Barham suggested that gastrophysics is to gastronomy what astrophysics is to astronomy. In the light of the Rutherford quote: “All science is either physics or stamp collecting” it’s clear that even popular food science is physics. Anyhow, I don’t quite see how gastrophysics differs from “molecular gastronomy”, but it’s an interesting topic nonetheless! Jens Risbo went on to share results from Louise Mørch Mortensen’s studies on the sensory effects of time (3-12 h) and temperature (56-60 °C) in sous-vide cooking of beef. The descriptors used could be divided into two main groups. One group (which included juiciness) varied proportionally with both time and temperature. 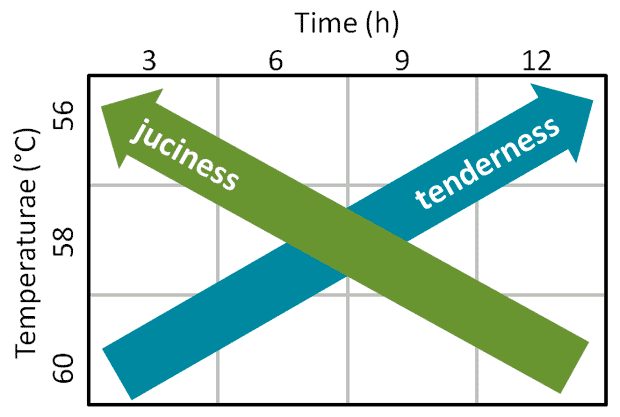 The other group (including tenderness) showed an increase with temperature but decrease with time (or the opposite: decrease with temperature and increase with time). A key result is that it is not possible to simultaneously optimize sous vide conditions for juiciness and tenderness. A recent paper on the sensory effects of time and temperature on sous vide cooked beef show that conditions cannot be optimized for maximum juiciness and tenderness at the same time. The study on meat sous vide was financed within the grant “Molecular Gastronomy–The Scientific Study of Deliciousness and Its Physical and Chemical Basis” which also financed Pia Snitkjí¦r’s study on meat stocks. 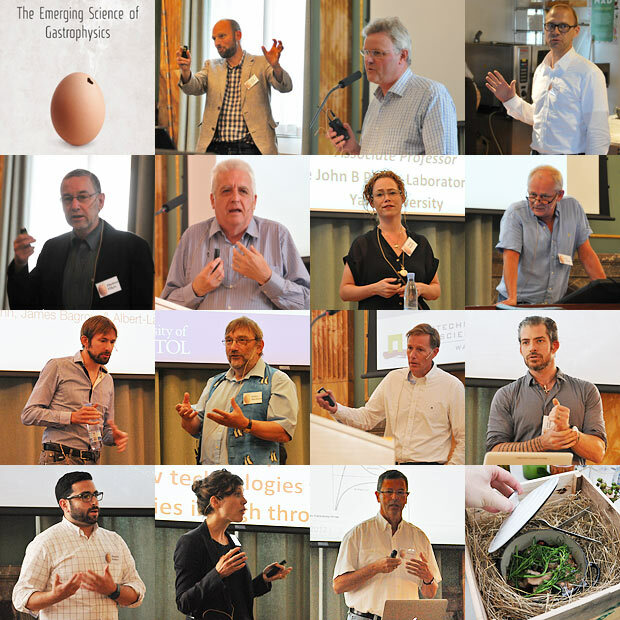 The seminar on molecular gastronomy held last year in Copenhagen marked the end of the project. Jens Risbo said the project had been great fun with lots of attention and scientific results. There was however perhaps a lack of “great answers” to “great problems” and also a lack of information at a molecular level. As it turns out, molecular gastronomy is actually rarely molecular. In his presentation Thomas Vilgis described how sugars can affect the mouth feel of agarose gels (the predominant component of agar). Interestingly this effect is removed by the addition of xanthan. There is a “fight for water” so to say between xanthan and sugar. The resulting agar gels are thus softer/less elastic. Agar/xanthan concentrations studied were in the range 0.25% agar/0.75% xanthan to 0.75% agar/0.25% xanthan. There were also rather technical presentations on hydrocolloids given by Erik van der Linden and Peter Shurtenberger, but I wasn’t able to extract any immediate practical applications in the kitchen from their results. Dana Small shared fascinating insights into how flavor works in the brain and started by explaining super-additive responses. With tastes and smells the sum can be more than the parts. For example, being exposed to sweet and vanilla at the same time induces a signal in the brain which is greater than the sum of signals from sweet and vanilla when tasted/smelled separately. The reason for this is that the neurons are located side by side, and as it turns out a smell sensation can actually induce a taste sensation. In a further study Small showed that our brain takes calories into account when judging flavor: increased blood glucose levels gave a higher flavor response in the brain! 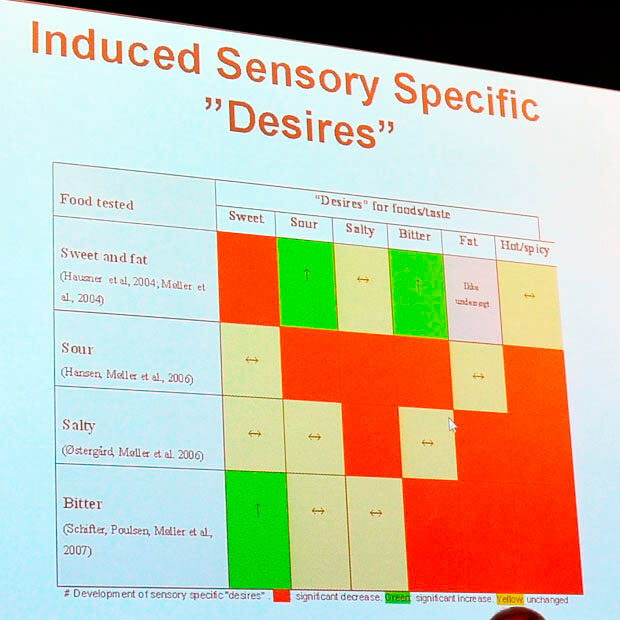 Møller also touched upon the question on how one food with a predominant basic taste can induce a desire for a different basic taste, and presented an overview (see picture below) of how sweet/fat, sour, salty and bitter foods influence your further cravings. The red diagonal testifies to the importance of variation. I was surprised there were not more “green” combinations, but I note with interest that a change from bitter to sweet and vice versa are desired transitions. This reminds me of the surprising yet very successful pairing of India Pale Ale (which is quite bitter) with a sweet, vanilla flavored crí¨me brí»lée! From Per Møller’s presentation: You don’t want more of the same. Eating something bitter makes you desire something sweet (and vice versa). Given the recent attention flavor pairing has received I was really looking forward to Sebastian Ahnert’s presentation on flavor networks. 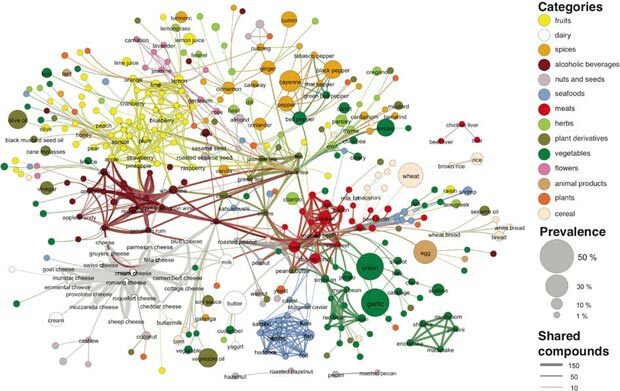 Treating foods and the flavor compounds they contain as a bipartite network allowed Ahnert to study the resulting connections with the toolbox available for complex network research. The somewhat surprising findings reported earlier this year was that western cuisine tends to favor dishes in which ingredients share compounds whereas asian cuisine tends to use ingredients not sharing compounds. The greatest weakness of the published results in my opinion lies in the fact that Fenaroli’s Handbook of Flavor Ingredients was used as a source for the volatiles. Secondly I believe that only counting the number of overlapping volatiles (a type 2b flavor pairing according to my previously published classification) is of limited interest. Despite these critical remarks I really like the data mining approach of Ahnert, and during his presentation he discussed several strategies to improve the data. By using 1) concentrations of compounds from the VCF database, 2) odor/flavor threshold values compiled by Leo van Gemert and 3) odor/flavor descriptions from Fenaroli’s to analyze flavor pairings suggested by chefs in The Flavor Bible, Ahnert found that the ingredient pairs in The Flavor Bible share more compounds than would be expected by chance. Furthermore, if the analysis is limited only to compounds that have odours or flavors of food (based on the descriptions in Fenaroli’s) the result is even more significant. This lead Ahnert to formulate a modified hypothesis: “Two foods taste good together if they share dominant* chemical flavor compounds with food aromas” (* in terms of concentration). The backbone of the flavor network, taken from Ahnert’s paper “Flavor network and the principles of food pairing” published in 2011 in Scientific reports (Creative Commons Attribution-NonCommercial-ShareALike 3.0). Peter Barham took a popular science approach and started by arguing that since the kitchen is a laboratory, cooking may be looked upon as an experimental science. And as a consequence the a scientific approach with taking notes (I agree), evaluating the outcome and presenting the results followed by further experiments should result in a steady improvement. He went on explaining a practical joke he has served to a total of 18 Michelin star chefs, an “organic raspberry sorbet”. The catch lies in organic which in this case means “hand crafted by an organic chemist” – every single ingredient in the sorbet is synthetic. A yes – I think all the top chefs liked the sorbet. Physics is about precise measurements and precise control of variables, and both are also quite useful in the kitchen. An obvious example is sous vide. Barham showed a picture of lamb cooked at 56.6, 57.0, 57.5 and 58.0 °C (for ? hours) and the color was actually remarkably different between the meat slabs. According to Barham the same applied to the texture and flavor as well. He preferred his lamb cooked at 57.5 °C and lean beef at 53.5 °C (and since his wife has different preferences he has 2 water baths to solve that). Last year, at the molecular gastronomy seminar in Copenhagen, Barham demonstrated how microwaves penetrate a potato (besides trying to set an ice cold world record) and how the transition from crystalline starch to a melted starch (at 60 °C) absorbing water yields a visible ring (which can be measured and used in a science project). Texture matters a lot for potatoes, and Barham described how large temperature gradients (i.e. cooking at high heat, for instance in a pressure cooker) allow the outer granules to swell up early, resulting in larger stresses which causes the potato to fracture and become “fluffy”. This is good and desirable for roast potatoes and chips as it gives a large surface are from which water can evaporate, allowing the starch to turn glassy. For boiled and mashed potatoes long cooking times at low temperatures would be preferred, resulting in a uniform texture. 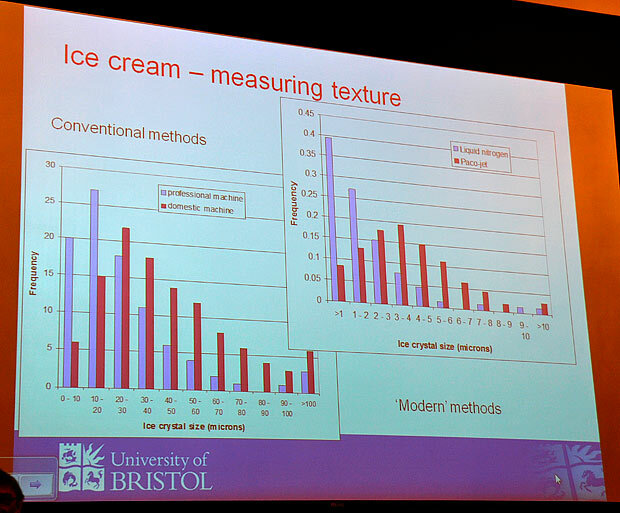 Peter Barham found that the crystal size of ice cream varies greatly with the method of preparation. Crystal size increases as follows: liquid nitrogen < Paco jet < professional machine < domestic machine. The big surprise: ice cream made with liquid nitrogen has crystals small than 1 µm! With the advent of domestic sous vide and renewed interest in pressure cookers Barham sees there is a need to educate people about the dos and don’ts. And fears that it is only a question of time before some one will die, having eaten food cooked for too long at a too low temperature. In line with the five aspect meal model developed at Grythyttan Michael Bom Frøst stated that “a meal is a context” and there is an interaction between the product (i.e. the food being served), the person and the whole restaurant setting. In order to study this interaction more deeply three restaurant experiments were done. The first experiment showed that the verbal presentation of a dish influenced how consumers scored the descriptors “liking”, “surprise” and “challenging”. Dishes presented with so-called “process information” (i.e. how the dish was prepared, temperature, time etc.) were generally more liked. Interestingly the presentation had the greatest effect on the least liked dishes. So the next time your waiter goes on and on about what you are eating you should maybe take it as sign of warning 😉 Complexity and appreciation was the topic of two further studies. I covered these last year, so no more details here. 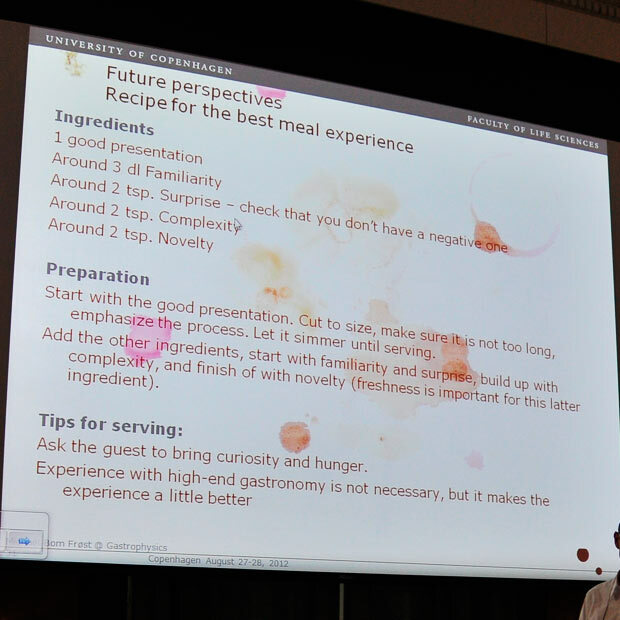 Frøst ended his presentation with a popularized version of his results, presented as a recipe for the best meal experience. Michael Bom Frøst’s recipe for the best meal experience. The chefs Lars Williams (previously Nordic Food Lab, now at noma) and Daniel Felder (Momofuku) made a brave appearance in an otherwise very technical and scientific setting. They shared their enthusiasm and experience from working with fermented foods, in particular Japanese fermented foods made with the fungi Aspergillus oryzae, perhaps better known to foodies as koji. The fungi produces starch degrading enzymes and grows rapidly on grains such as barley (more on that in an upcoming post about the visit to Nordic Food Lab). 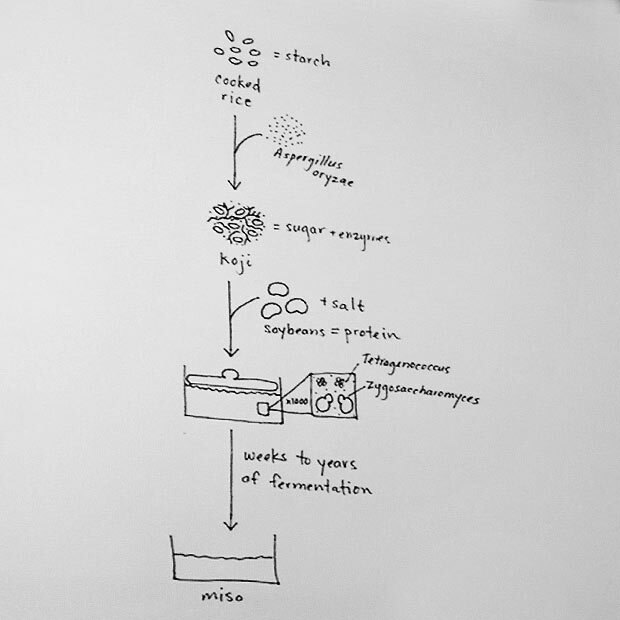 Once the fungi has grown (and multiplied) on barley it can be used to inoculate soy beans to make miso (see slide below). With this as a starting point Williams and Felder explored the use of koji to ferment other foods such as yellow peas and pistachios (resulting in peaso and piso respectively). They also described the use of koji to ferment fish (to make katsuobushi) or pork (to make butabushi). Williams also briefly touched upon his work with acetic acid (i.e. vinegar) and lactic acid (i.e. kimchi) fermentations. Coming to a conclusion the chefs stated that their goal is to create a new “culinary identity” by using fermentation as a “living tool”. All their experiments are guided by taste. And did I mention that there were tasting samples for everyone in the audience? Thumbs up for that! Amy Rowat studies the physical and molecular origins of cell texture, and happily applies her know-how to food whenever possible. At UCLA she is responsible for a Science & Food course (with guest lecturers and a blog) – a west coast pendant to Harvard’s science and cooking course. The main idea behind these courses is to make the material so inviting and delicious that the students wanted to learn the underlying science. In her presentation at the seminar she promoted food as an excellent medium to communicate science, giving several examples for DIY experiments. With a cheap scale her class studied how mushrooms lose mass in salt water by osmosis. By analyzing the initial slope of the mass vs. time curve the flux of water molecules could be estimated. And given that the surface area of the mushroom as well as the salt concentration of the water and the mushroom were known it was possible to calculated the diffusion coefficient of water using Fick’s law! Rowat also let the Science & Food course students explore the pressure infusion technique invented by Dave Arnold in greater detail. One surprising finding was that a slow pressure release increased the extraction efficiency! Quite amusingly, Rowat explained that this extraction technique actually works so well that they now use it in the lab to isolate plant cell nuclei from Arabidopsis. That is one rare example of how a kitchen technique is taken back into the lab! The symposium also included the best conference lunch I have ever had as well as a visit to the Nordic Food Lab who was so kind to prepare this lunch. I will cover both in a future post. In my presentation at the symposium I talked about mineral water and went on to discuss the effects of water hardness on onion texture. There will be a separate blog post about that as well. Mortensen, L. M.; Frøst, M. B.; Skibsted, L. H.; Risbo, J. “Effect of Time and Temperature on Sensory Properties in Low-Temperature Long-Time Sous-Vide Cooking of Beef” J. Cul. Sci. Technol. 2012, 10, 75-90. DOI: 10.1080/15428052.2012.651024. Maurer, S.; Junghans, A.; Vilgis, T. A. ” Impact of xanthan gum, sucrose and fructose on the viscoelastic properties of agarose hydrogels” Food Hydrocolloids 2012, 29, 298-307. DOI: 10.1016/j.foodhyd.2012.03.002. Hausner, H.; Olsen, A.; Møller, P. “Mere exposure and flavour–flavour learning increase 2–3 year-old children’s acceptance of a novel vegetable” Appetite 2012, 58, 1152-1159. DOI: 10.1016/j.appet.2012.03.009. Ahn, Y.-Y. ; Ahnert, S. E.; Bagrow, J. P.; Barabási, A.-L. “Flavor network and the principles of food pairing” Scientific reports 2011, 1, 196. DOI: 10.1038/srep00196. With parsley as an example I used data from a paper on key odorants for parsley leaves and compared these with the volatiles mentioned in Fenaroli’s handbook. It turned out that a number of the volatiles Fenaroli’s links to parsley have low or no impact on the flavor of parsley, and vice versa, a number of the high-impact flavor compounds in parsley are not mentioned by Fenaroli’s at all. Mielby, L. H.; Frøst, M. B. “Expectations and surprise in a molecular gastronomic meal” Food Quality and Preference 2010, 213. DOI: 10.1016/j.foodqual.2009.09.005. As a note, I wouldn’t overplay the ‘glassy water’. 1um, though small, is still a perfectly respectable crystal. Amorphous ice isn’t particularly stable anywhere near room temperature, though of course, being embedded in an ice cream matrix is not a condition that has been particular extensively studied before! I am quite curious about the topic of one particular flavor inducing desire for other flavors. It says that sweet and fat increases desire for the sour and bitter. I think it is worth looking into what flavors are induced with “fatty” flavors, or even fatty and salty since they often come together as in the case with many cured meats and steaks. Besides the parsley example, do you have any other objections to Fenaroli’s handbook? Are there any other good resources out there? Parsley is just an example. I assume the same holds true for all the entries in Fenaroli’s handbook. The fundamental problem is that the handbook is focused on concentrations, and thereby misses many of the more potent, low-concentration compounds. MattC: Note that the slides says “smaller than 1 um”. And yes – they did a lot to prevent samples from heating during analysis. But then one should of course consider that any error introduced due to heating of samples would probably increase the size of the observed crystals. re: Fenaroli’s; be wary, too, of reducing flavor chemistry down to only high-impact or supra-threshold volatiles (not to mention down to concentration alone, which is just crazy) , given how much aroma perception is affected by interactive effects between volatiles, and often involving “sub-threshold” aromas. [to be fair, I am somewhat biased towards interactive effects] Still, using some threshold/OAV data is better than using no sensory at all. And it seems to me that, taken to a logical endpoint, Ahnert’s hypothesis would hold that the best pairings would be between chemically near-identical ingredients…which I don’t think is the case. The follow-up he presented sounds interesting, though, I just wish I hadn’t missed that session! Kevin: I’ve found that the perception/psychophysics/cognitive psychology literature has somewhat paradoxically helped me understand flavor chemistry better than the purely flavor chemistry literature has, if you want somewhere to go looking. Arielle: “The sum is more than the parts” – yes, you make a good point there! Do you have any good examples of interactive effects of “sub-threshold” aromas? Hi Martin, thanks for the interesting review of these interesting lectures! Regarding particle size, Stephen Beckett, in his book “The science of chocolate” mentions that particles larger than 30 microns would make the chocolate feel gritty. Thus, the sugar and cacao particles are repeatedly milled and crushed during the chocolate preparation process.